Yogrishi Vishvketu is a Himalayan yoga master, yoga teacher, founder of Akhanda yoga and Anand Prakash Yoga Ashram. Yogi Vishvaketu started his yogic journey at the age of 8, when he went to gurukul in Kanvashram to study meditation, Vedic philosophy, sanskrit, chanting, yoga and ayurvedic sciences. He continued his yoga education in Gurukul Kangri, the Philosophy university of Haridwar where he attained his Bachellor's degree, M.A. and Ph.D. in yoga philosophy. Visha Ji continued his study and practice in Yoga Niketan Ashram seeking advanced teaching in pranayama and yogic cleansing techniques from Yogi Nath, while giving his own classes and inspiring students from all over the world to follow a yogic path. In 2001, Yogrishi Vishvaketu moved to Canada, where he shared his knowledge of yoga on numerous venues. 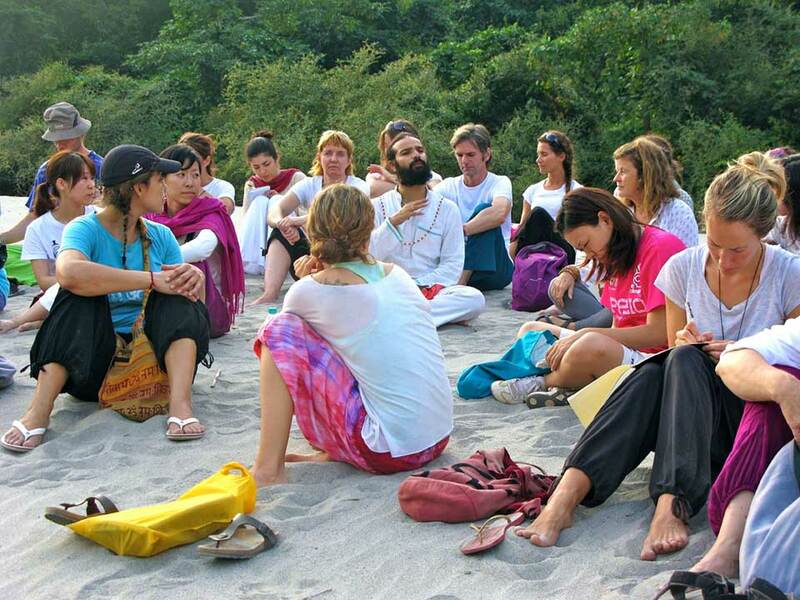 In 2007, after many years of teaching internationally, Yogi Vishvketu founded Anand Prakash Yoga Ashram in Rishikesh. 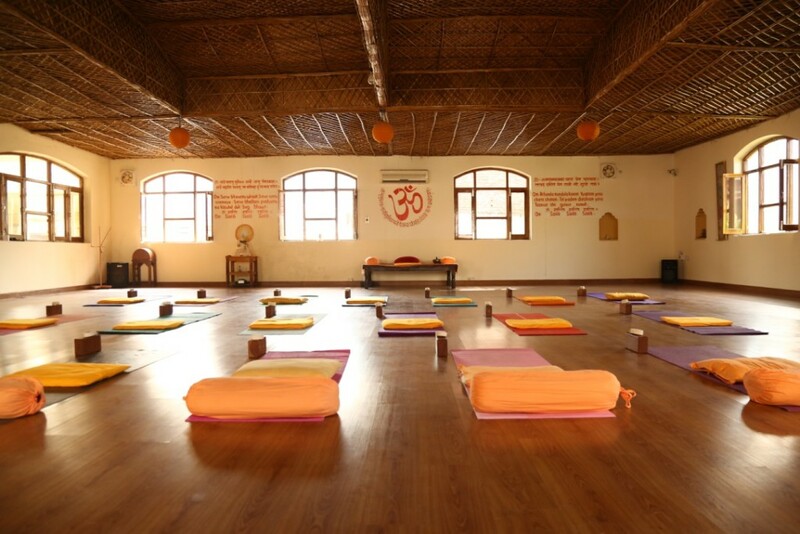 This is a place of spiritual practice and deep immersion into yoga lifestyle where many courses, retreats and teacher training courses take place. This is a place of gathering for Akhand Yoga family. Akhanda yoga is a holistic system that does not limit itself with one lineage, but draws from multiple sources of wisdom. The practice includes all aspects of yoga such as cleansing techniques, asanas, pranayamas, mantra chanting, kirtan and meditation, and draws from philosophies of Classical Yoga, Samkhya, Vedanta and Tantra. If you’re in Rishikesh, I advise you to go and try Akhanda yoga class with yogi Vishvketu at least once. He teaches in his beautiful Anand Prakash Ashram in Tapovan, usually at 6 in the morning. 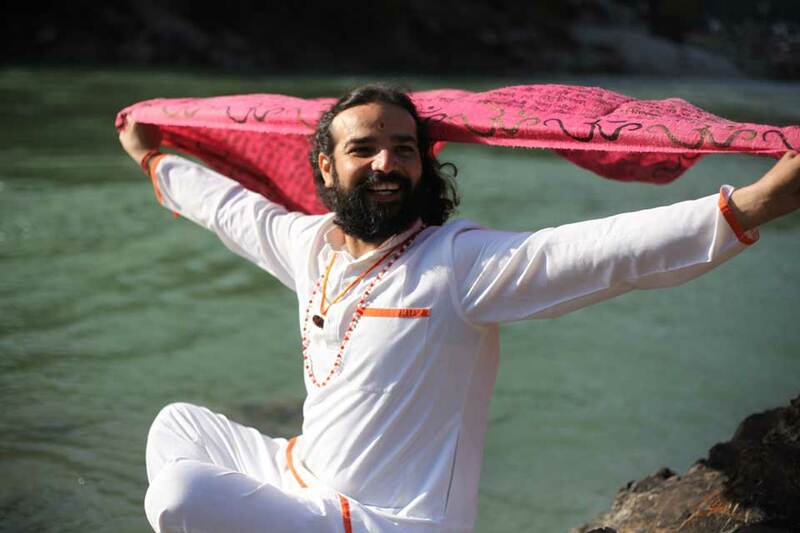 Yogi Vishvaketu is a yoga teacher who is known both in Rishikesh and internationally, particularly in Canada, and who teaches classes of “Akhanda yoga” - his own style of practice that combines influences of classical hatha yoga, kundalini, and tantra. Classes of akhand yoga include practice of asanas, meditations, mantra chanting, kriyas and pranayamas, and short discourses on yogic philosophy. If you have never been at akhand yoga class before, you can expect a good hatha yoga class of moderate to high intensity that starts with about 10 minutes of mantra chanting and some vigorous breathing exercises like kapalabhati, bhastrika or other intensive breathing practices that at times remind kundalini breathing techniques, in which intense exhales are synchronized with the movement of the body that helps to expel the air from the lungs, and inhales are assisted by movements of arms and shoulder to open the ribcage. The breathing exercises have activating effect and get you ready to perform challenging asanas. There is usually a few rounds of surya namaskar that are modified according to the intensity of the class and may include chair poses, Warrior 3 or other challenging standing poses somewhere within or in between the surya namaskara sequence. In his asana sequence, Vishvaketu often gives options of the yoga pose one can perform depending on the desired intensity of the class. This makes his classes both accessible for the beginners and interesting for experienced students. His asana sequence are often directed at strength building and include series of challenging poses done in succession without much break in between the poses. In particular, Yogrishi likes to put chair pose or its variations right after on in between standing balances. Vishvketu pays particular attention to breathing and very often reminds students to be aware of the breath in the middle of vigorous practice. Quite often students perform kapalabhati or brahmari while holding a posture. Also, Vishvakety pays attention to facial expression and instructs students to relax their face and smile in the middle of vigorous sequence. That helps students learn relax their minds and release the tension while keeping intensity of physical performance. One interesting feature of Yogi Vishvketu’s style is that he often gives theme to each class. The theme touches upon both mental attitude (what is the focus of mental work in the class), and physical focus. This helps to direct attention to certain sensations and processes within the body and mind, and provides some diversity to each class. It also teaches one to “embody” philosophical aspects of yoga and apply them into practice through performing asanas. Sometimes Vishvaketu gives hip-opening classes. These are less vigorous sequences aimed at allowing the body to release the tension from previous intensive classes, deepen one’s flexibility and reveal emotions that are hidden at the root of our psychic beings. These emotions sometimes spontaneously come up to the surface and we learn to observe them with equanimity and detachment. Besides Akhand yoga, Vishvaketu occasionally gives kundalini yoga classes, that are more dynamic than his ordinary classes and directed not so much at developing physical strength and stamina, as at awakening chakras with fast movements and breathing techniques. Vishvaketu conducts classes in a soft voice, in a friendly and easy-going way, using humor and very appropriately placed jokes to uncharge the intensity of the practice. He invites practitioners to explore their limits and progress in practice, but never forces anyone beyond their capabilities. His adjustments are confident, but very attentive and he doesn’t push you where you are not ready to go. He very often provides counter-indications to pranayamas, kriyas and asanas, so his classes are safe to all practitioners, even physically challenged. Although, persons who have high blood pressure or psychic disorders need to exercise caution during vigorous breathing techniques and dynamic practices. Yogi Vishvaketu is not in Rishikesh all the time, though. At least half a year he spends in Canada and other countries, conducting retreats, courses and seminars, so you need to check his website for the dates of his presence in Rishikesh. - creative techniques of releasing psychic tension through laughter, mantras and kriyas and hip openers. Conclusion: class of Yogi Vishvaketu is an opportunity for practice and learning not to miss! Yogi Vishvketu (sometimes spelled Vishvaketu) is a well-known teacher both in India and abroad. I particularly liked his classes because he was one of the few teachers at the time conducting classes very early in the morning which is just my personal preference. His school is what most western students imagine as an ideal studying environment. 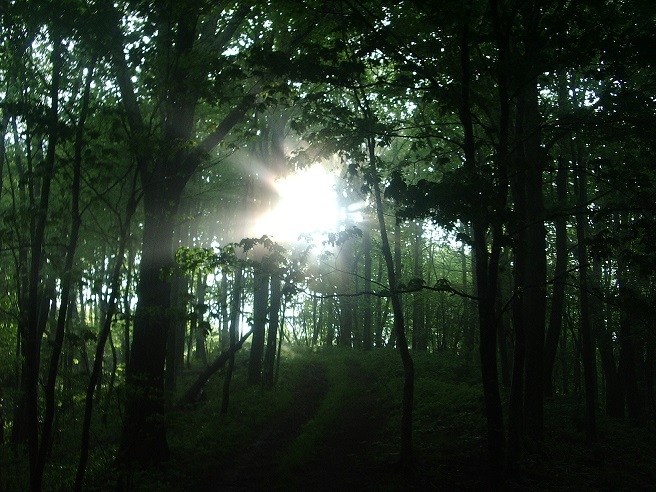 One can easily perceive the quality of a concentrated focus on practice, mindfulness, and other yogic values. His classes usually attracted a lot of students, making it a bit challenging for the teacher to keep an eye on every single student, although some assistants were helpful. Being a very accomplished and knowledgeable teacher, Yogi Vishvaketu's classes offer something for everyone, regardless of the level. The combination of the early morning hours, intense asana practice, and powerful pranayama exercises can create an unforgettable experience for participating students, motivating us to continue our never-ending search for improvement. I’ve been. Coming to Rishikesh for February and March for four years. I always take classes with Vishvketu. I was there this morning! This year I stayed at the Ashram for a few nights and would recommend it! If you are in the Northeast part of USA, he will be teaching at the Kripalu Center for Yoga and Health in May. I lead a group to Rishikesh every year and everyone I’ve introduced to his teacher has loved him. I especially love his sense of humor and the honeybee for us. The yoga hall is beautiful by worldwide standards with high ceilings, windows on three sides, a beautiful hardwood floor, and plenty of props. 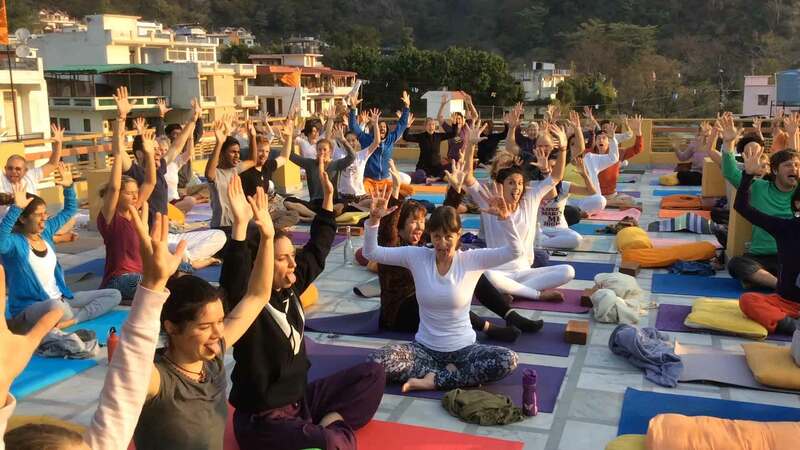 When the weather gets warmer, in March, the early morning class is often on the rooftop overlooking the Himalayan mountains with the Ganga river below.